Regan Alger, the Lady of Cantrell, is bored with her life. Yes, she’s been more fortunate than most. She was once married to a wonderful gentleman, and this love resulted in her young son—a boy she loves more than anything. But even a son can’t fill the void in her life. 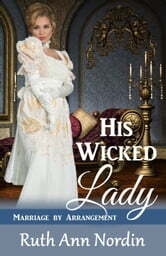 She misses having a husband, both in and out of bed, so when she happens to come across a gentleman at a ball who ignites her passion, she decides he’ll be her next husband. And she’s not the least bit shy about letting him know it. Just as determined as Regan is to have Mr. Malcolm Jasper for a husband, he’s equally determined to end up with anyone but her. If he marries her, his life will be one of chaos and scandal. He’s sure of it. After all, she’s much too outspoken and flirtatious. So he jumps at the chance for an arranged marriage, thinking once he secures a reputable and quiet bride, Regan will leave him alone. Little does he know, though, his sister and her two friends know Regan wants to marry him, and they are more than happy to help Regan get what she wants. Regan’s risk pays off. She manages to secure him as her husband. Will the gamble pay off? Or has she just doomed them both?